Here’s a basic hat and mittens knitting pattern set for you to enjoy. This knitted set will make a great last minute gift idea, a charity knit or simply a nice set for yourself. Pick out some wonderfully soft yarn and get started. And if you’re a fan of knitting hats and mittens on straight needles you’ll love these fun and quick knitting patterns. I started knitting the hat pattern and ended up having so much yarn left over so I decided to knit up the 2 needle mittens pattern to go with it. And the mittens pattern ended up being just as fun to knit as the hat. After all you can’t go wrong with some toasty mittens. And they’re great for making snowballs. I haven't made a hat and mittens pattern set to share with you so I'm glad I made it and it ended up being a fun knitting project. 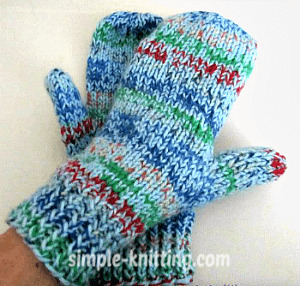 Knitting mittens is fun and this basic two needle pattern will help show you how to knit them. A lot of knitters, knit mittens on DPN’s (double-pointed needles) or circular knitting needles but I still enjoy the 2 needle version. You may notice that the hat and mittens pattern have a more decorative ribbing stitch. I decided to add a little eye candy to the ribbing by using a twisted ribbing stitch pattern instead of the usual 1 X 1 ribbing. I think it’s pretty, what do you think? So let’s get started with the hat and mittens! 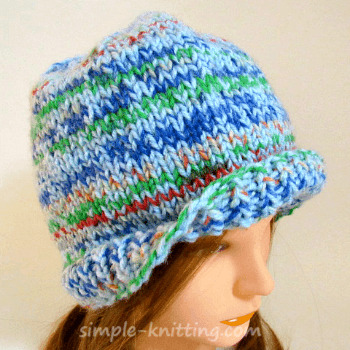 Sizing: The hat will fit adult head size approximately (20 – 23 inches). Mittens will fit woman’s hand size between 7.5 and 9.5 inches and also man’s hands too. My friend Ted tried them and they were nice and cozy. The hat fit him too. Notes: I decided to give you a choice when you start increasing stitches for the thumb gusset. You can use the quick and easy knit front and back method or choose the make 1 left and make 1 right. I prefer the M1L and M1R. Don’t worry though. There’s instructions for both. I also decided to add some warmth to my hat and mittens and used up some of my woolly sock yarn which actually created a nice colourful design. Using long tail cast on method and size 7 needles cast on 88 sts. Cut yarn leaving 8” tail and thread through yarn needle. Work needle through remaining sts and pull tightly and fasten. I usually put needle through top sts twice to make sure it’s securely fastened. Seam up back of hat and weave in ends. Beginning at cuff and using size 7 needles, cast on 38 sts. Work twisted ribbing pattern for 2 inches as follows: *Knit through back loop, purl, repeat from * across row. Switch to size 8 needles and work Stockinette stitch for 10 rows. K18, place marker, M1L, k2, M1R, place marker, knit 18 sts. Continue increasing within the markers on knit rows until there are 14 sts ending with a purl row. K18 sts, drop marker and knit 14 sts. Stop and place those (just knitted) 14 sts on a stitch holder or scrap piece of yarn. Cut yarn leaving about 12” tail and thread through yarn needle. Run needle through remaining sts beginning at the opposite end of needle. Do this twice to fasten securely. Slip sts from holder and knit Stockinette stitch for 12 rows or approximately 2 inches ending with purl row. Next Row: K2tog across row, cut yarn leaving 10” length and thread yarn through remaining sts. Slip sts off needle and pull tightly to close up the thumb tip. Seam up thumbs and fold mitten and seam up sides.